4397 Lakeside Drive, Bemus Point, NY.| MLS# R1127267 | Chautauqua Lake Real Estate Services. Informed, Professional Real Estate Information Serving Buyers and Sellers Interested in Lake Chautauqua Real Estate and Chautauqua County NY Real Estate. Rick and Julia McMahon Real Estate Advantage Since 1992. This 3588 Sq ft raised ranch is situated on almost 1 acre of prime Gold Coast property that includes 123 Ft of of private Lakefront. The main level features a lg open living rm has a Wood burning fireplace and beautiful view of the lake, a wet bar with sink, 2 master brm suites, and the comfort of central air. 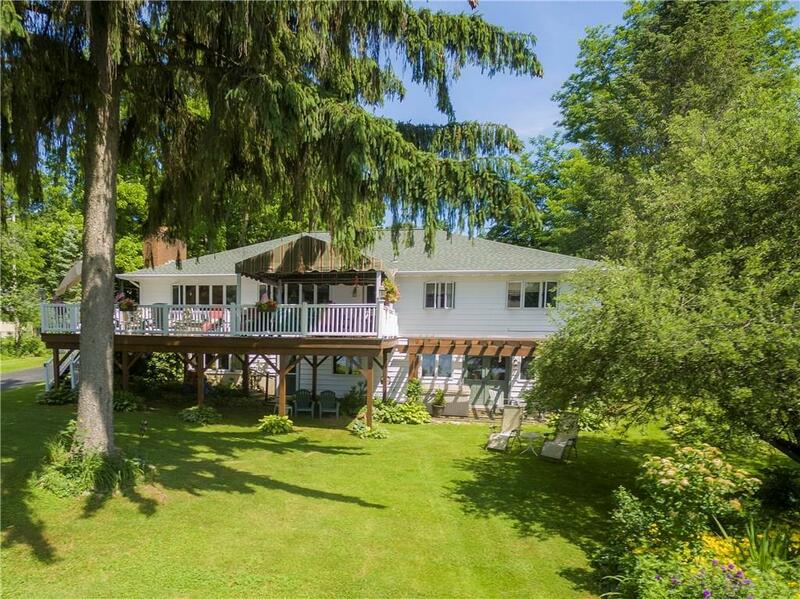 Walk out onto the extra large deck that over looks Bemus Bay where you can choose to sit in the shade of the 20x38 awning or sun bath in the open area. On the lower lever is a family rm that opens out to a patio where you can relax in the hot tub. The lower level also features a one bedroom private guest quarters with a separate entrance, kitchen, bath and laundry. In addition to the 2 car attached garage there is a detached 2 story garage with outdoor dog run. Directions To Property: Just Pass The Sharp Curve On Lakeside Drive, Approx 4 Homes On The Lakeside You Will See Our Real Estate Sign.